The Syrian Democratic Forces say its will be at least two or three months before any residents are allowed to return to the city of Raqqa, over the threats of road mines and booby-traps left behind by Islamic State group militants. The US-backed SDF declared victory over ISIS in its former “capital” last week, proclaming the northern Syrian city free of any extremist presence after weeks of fighting. On Sunday, Russia accused the US-led coalition of bombing the city “off the face of the earth”. As winter approaches, Raqqa’s new rulers face a race against time to make it habitable once again. Most of the city has yet to be cleared. The bodies of IS fighters lay in the streets where they died a few days ago. 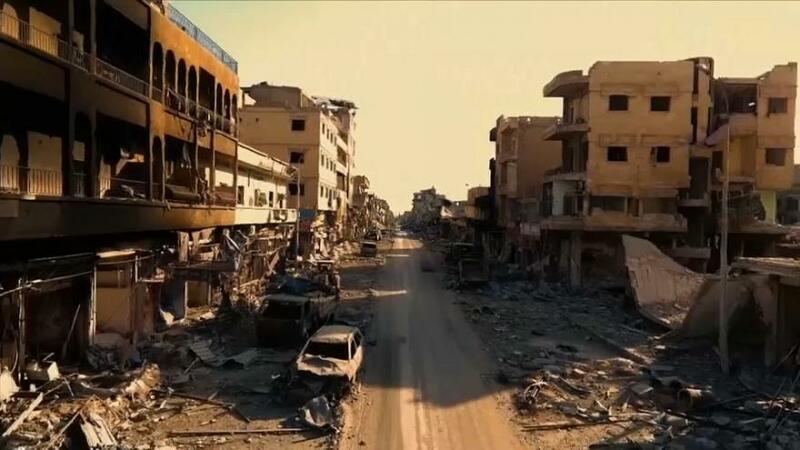 Drone footage filmed in the center of Raqqa on Saturday showed the extent of devastation caused by weeks of fighting between Kurdish-led Syrian Democratic Forces (SDF) and Islamic State group. Entire neighbourhoods were turned to rubble with bombed-out houses standing as empty shells, burned out vehicles lining streets, and twisted metal and rubble covering the ground. The fall of Raqqa marks a major defeat for IS, which has seen its territories steadily shrink since last year. IS took over Raqqa, located on the Euphrates River, in January 2014, and transformed it into the epicentre of its brutal rule.